Over the years I have taught hundreds of managers how to communicate effectively. One point I often make is that you should be focusing more on the goals and messages, and not just obsessing over minute rules of grammar, spelling and punctuation. But these can sometimes be very important too, as we will see. 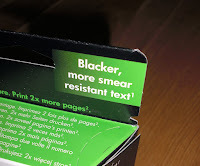 Yesterday I picked up a new ink cartridge for a printer and I was mildly surprised to see the package promising “more smear”. Looking again I realized that it really said “More smear resistant”. The reason my brain was fooled into not reading the second half of the adjective is that the hyphen was missing. If I had seen “more smear-“ my mind would have delayed interpreting the phrase until I had read the next word.